Capcom has revealed its plans to release downloadable content for its latest fighter, both free and (inevitably) for pay. 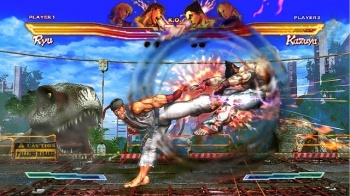 Street Fighter X Tekken hit shelves a mere 10 days ago, but Capcom has long been toiling away on extra content for the virtual fisticuffs mashup. As of this morning, the company laid those plans bare. Included is word on the game's additional DLC characters, additional gems and a host of tweaks designed to improve the core game. Swap Costumes are available for $1.00 (80 Microsoft Points) each, or if you wanna dive in for the whole assortment you can pick up the Street Fighter or Tekken collection packs for $13.00 (1040 MSP) each - buying one pack saves $6.00, grabbing both saves $12.00. April 3 also brings three free color packs, each containing four new additions to the palette for added customization options. Topping off the April 3 additions are three new quick combos, making for a total of five pre-programmed attack patterns. While spamming these pre-set combos is tempting, don't forget each use saps some of your Cross Gauge! Shortly after those items arrive, look for a free tournament support title update that will add a new and faster way to select your gems from the versus screen via a dial system. We'll actually run a live stream this Monday at 4pm PT to show off this update, so head to our Twitch TV page for details. The tournament update will also include improvements to the online sound issues discussed in Ayano-san's earlier blog. Looking just a few more weeks beyond the tournament support addition, the next big wave is a massive selection of free content delivered as a title update. This includes three new Assist Gem packs and six new Boost Gem packs, which add over 60 gems to the selection pool. This sizable infusion of new gems exponentially increases the customization options for every player, so we should see some interesting new loadouts once this DLC arrives. To that point, we're also tossing in three more gem slots per character in which you can save your preferred loadouts. Finally, this update comes complete with a free replay analyzer, which enables you to dissect each fighters' vital statistics. The biggest additions come soon after the PlayStation Vita version launches later this year - the 12 characters debuting on Vita will come to consoles as a $20.00 (1600 MSP) bundle. I know many were worried past character pricing would push the cost of this update sky high, so I'm happy to say Blanka, Sakura, Guy, Cody, Elena, Dudley, Alisa, Bryan, Christie, Jack, Lars and Lei will not break the bank. So, let's recap: Come April 3 the game will see a host of additional costumes priced at $1 each (or $13 for all of the Street Fighter or Tekken character costumes; that works out to $26 for the entire series). Likewise, the company will also release three free color packs that include four new colors per character, as well as three new quick combo slots, free of charge. Sometime after that -- Capcom optimistically says "shortly after" -- Street Fighter X Tekken will also receive 60 new gems and three new gem slots per fighter, as well as a "replay analyzer." This too is totally gratis. Then, once the Vita iteration of the game hits shelves, the PS3 and Xbox 360 versions of the game will receive 12 additional downloadable characters. Players will be able to buy all of these characters at once for $20. Barring the rage the internet has for the amount of DLC content already present on the Street Fighter X Tekken disc, how do you all feel about this? More content is always welcome, no? Or are those prices a bit too rich for your blood? Leave your angry/giddy/whatever comments below.